In September 1944 the British submarine PORPOISE left Careening Bay in West Australia for the enemy controlled waters of South East Asia. On board were 23 commandos, all highly trained members of Operation Rimau, who had high hopes of repeating the successful Jaywick raid of 1943 by mounting an attack on shipping in Japanese-occupied Singapore. When the party was successfully infiltrated behind enemy lines, tonnes of stores were transferred to small, jungle-covered Merapas Island, 110 kilometres from Singapore. Being the most easterly of the islands that form Indonesia’s Riau Archipelago, Merapas was suitable as both a rear base and a rendezvous point with the rescue submarine, scheduled for the night of 7th November. As the first phase of the operation was over, PORPOISE returned to Australia. Apart from the Japanese and a handful of local people, no one ever saw the 23 men again. Although it was discovered post-war that ten had been captured and beheaded, the fate of the rest remained a mystery for almost 50 years. In 1988, I began the lengthy process of assessing and evaluating evidence researched over three decades by Tom Hall, a retired army major. In 1990 this research, combined with additional information obtained in 1989, resulted in the publication of The Heroes of Rimau, a book now recognised as the definitive history of both the Jaywick and Rimau raids. 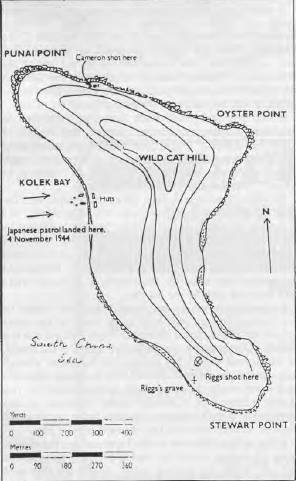 Hall’s painstaking investigation revealed that on the afternoon of 10th October, 1944 only hours before the raid was to take place, the Rimau party had been surprised by a boatload of quasi-military collaborators at the Indonesian island of Kasu, not far from Singapore, Fearing that the Japanese would descend in large numbers the men scuttled the ultra secret submersible boats (SBs) in which they had intended to mount their attack. All but seven men then paddled back to Merapas Island in small canvas folboats (kayaks) to await the arrival of the submarine. That night the seven-men raiding party, using folboats in place of the SBs, placed limpet mines on a number of ships, sinking at least three. After observing their handiwork from the safety of a jungle-covered island, the raiders paddled to the Riouw Straits where they intended to attack enemy ships riding at anchor near the town of Tanjung Pinang. While reconnoitring targets on 16th October they were betrayed and, in the search that followed, four were killed and one was captured. The other two escaped unscathed to join the remainder of the party, who had reached Merapas without incident. Here they remained, their presence undetected by the enemy, until 4th November when a small contingent of Japanese arrived without warning. Believing that the fuel line of a plane which had been forced to land at nearby Kidjang, on Bintan Island, had been severed by someone (possibly an enemy agent) firing at it from one of the many islands in the vicinity, the Japanese had instituted a search of the area. Having found no evidence of any agents to date, the enemy may have left Merapas without bothering to go any further than the beach had one of the Rimau men, hidden deep in the jungle, not opened fire accidentally with his silent Sten gun. The bullets found their mark, killing the Japanese commander instantly and mortally wounding his batman. Unwilling to venture into the jungle against an unknown number of opponents using soundless weapons, the Japanese returned the fire. With darkness about to fall and the situation at an impasse, they then radioed Kidjang for reinforcements. When the back-up troops arrived around– noon the next day, the action was over. During the night all but eight of the Rimau men had managed to escape, leaving behind a large amount of stores and their hammocks, cunningly concealed in the secret jungle camp. In 1981, while visiting the island in his quest for information, Hall learned from the local people that on the morning of 5th November one of the Rimau men who had remained hidden on the island had been shot. His skull, which was found in 1976 by Mr Karta, the owner of the island, was purchased by Hall and taken to Australia for forensic analysis. A subsequent examination of the skull by Dr Godfrey Oettle of Sydney’s Institute of Forensic Medicine revealed that it belonged to an Australian, Sergeant Colin Cameron. With the fate of Cameron established, Hall had tracked down and accounted for all but one of the Rimau men. The man who still eluded him was Scottish sailor and SB expert, 21-year-old Sub Lieutenant Gregor Riggs, of the Royal Naval Volunteer Reserve.